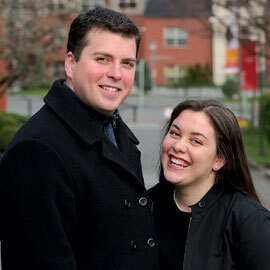 GLENDA AND SHAUN ELLINGSON are a hardworking young married couple devoted to each other, their jobs at Seattle Pacific University and their education. recently established a scholarship for married students. Shaun, a security officer and manager of the SPU motor pool, is intent on earning a degree in business administration. Glenda, Seattle Pacific�s program manager of grants and scholarships for Student Financial Services, received her degree in organizational behavior in December 2003. Because the Ellingsons have a concern for married students who struggle financially, they established a scholarship last year that benefits a married student who works at least 20 hours a week and carries a full-time academic load. This year, they are in the process of establishing an endowment that will create even more scholarship help for married students. Another large subset of new donors includes people with no previous connection to Seattle Pacific, who gave to The Campaign because they found the University�s vision to engage the culture and change the world compelling. �I�ve seen SPU�s vision in action,� says Phil Pletcher. His first encounter with Seattle Pacific came through friend and SPU staff member Mark Miles. Together, they developed a mountain-climbing program for The Society of Fellows, and Pletcher was drawn to the graduates he met on expeditions to the summits of Mount Adams and Mount St. Helens. �Eight people on the team had graduated within the past five years, and they truly are people of competence and character grounded in the Christian faith,� says Pletcher. �They�re exciting to be around. I was 100 percent convicted to give back to the University that allowed me to develop the program and those relationships.� In fact, he was so impressed that he applied to become assistant director of research and grants at Seattle Pacific. His new job began in February.